Introduction… skip to the third paragraph if you’re in a hurry :) Some products are designed to be disposable… this may be due to health and sanitation reasons or simply because producing and delivering a new widget is more efficient than refilling or repairing an existing one. As the price of energy fluctuates and different delivery channels are established, products go from disposable to recyclable or refillable and supply chains adapt. In parts of Europe, nearly all waste is recycled because landfill space is limited and exporting trash has a high energy cost. Product disposal is also highly regulated and enforced compared with other parts of the world. In the United States there is ample room to bury trash and regulations are varied from state to state, as a result, many items that could be recycled are not. That’s not a bad thing in the short run as fossil fuels are used both to create and dispose of products but if we were harvesting renewables and could lower the gray costs of transport and recycling activities, it would make increasingly more sense to recycle. There are certainly other factors to consider such as the variety of trash being disposed of as well as population density and proximity to advanced recycling facilities. While the vast majority of materials used in consumer products can indeed be recycled, doing so isn’t always the best option… at least not immediately. In recent years, some older landfills have become mines where materials disposed of decades ago are being recovered. Okay, so let’s talk about electric bike batteries shall we? Why did I create such a long introduction instead of answering your question directly! Well, electric bikes use a variety of battery types including Sealed Lead Acid, Absorbent Glass Matt, Lithium Iron Phosphate, Lithium Magnesium Cobalt and other minor variations of Lithium-ion or Lithium polymer with more or less energy density and durability characteristics. What this means is that getting an exact replacement can be tricky and labor intensive… Your best option is usually to purchase direct from the manufacturer or a certified shop. 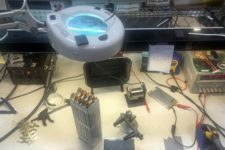 Not only do you want to protect the expensive controller and motor on your ebike, you want to make sure your house doesn’t burn down as the result of using an incorrect or damaged battery. This is why there are often warning labels and tamper stickers on batteries, urging you not to open them. 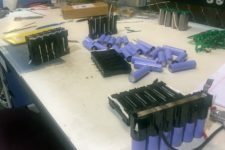 In many ways, ebike batteries are configured to be disposable / recyclable for safety reasons. 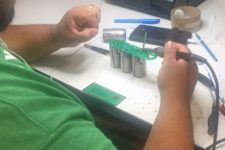 One company in Santa Cruz California called NTS Works decided to design a solution for reuse and recycling of their electric bike pack by offering to repack batteries sold with their electric bikes! 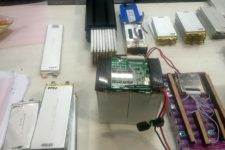 NTS Works, which seems to have gone out of business in recent years, offered a rebuildable upgradeable battery solution mentioned in an interview here. 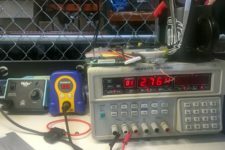 I suspect that the recent restrictions on shipping Lithium-ion battery packs has contributed to their transition… It’s expensive and time consuming to deal with batteries so most companies, at the time this article was created, simply do not. You have to be certified to ship hazardous materials and they are generally only moved via ground transport, not air. Big companies can ship the packs to their shop/dealer distribution points but consumers may struggle to ship them back because they are not hazmat certified, this is where shops and special shipping locations can help. Most companies I’m aware of simply prefer to trash or recycle used battery packs and encourage you to buy a new one. Renewable Power Energy (RPE) actually designs and sells their own line of electric bikes but their primary business is batteries. They offer a range of chemistries including Lithium Cobalt Manganese, Lithium Cobalt Oxide and Lithium Iron Phosphate which are optimized for fast discharge, heat resilience and lower price respectively. All offerings appear to come in pouch prismatic form vs. the cylindrical 18650 cell that are most common with new batteries (those from Samsung and Panasonic I usually see). 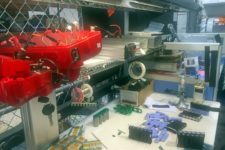 From what I’ve gathered, there are technicians at RPE who will open your battery, test the battery management system (BMS), remove the existing cells and fill the space with their pouches to meet or exceed the required specs of your ebike. This means that you could take an older bike battery casing and actually fill it with more energy to extend the range of your electric bike! I called the company to chat about the process and discovered that they began this type of work around 2011, are certified to ship hazardous materials to customers and have already successfully done this for IZIP, Stromer, e-moto and Easy Motion electric bike packs! One company that they’ve struggled to work with however is BionX because their controllers are more secure and proprietary with software locks in place. Thankfully, BionX is still in business and has a large network of authorized dealers who should be able to help you buy direct from the source. The turnaround time for battery rebuilds with RPE is one and a half to two weeks and they require you to discharge your battery completely before shipping using ground. You may also have to send your battery charger along so they can fill and test it. In today’s ebike market, Lithium battery packs are one of the most expensive components of the bike and I’ve seen them sell for as much as $800 a piece from Bosch, Specialized and other premium sellers. Over time we might see these prices drop but part of the reason they aren’t already lower is that dealers take a cut (and both of the aforementioned brands are dealer-only, meaning you can’t buy direct). With Renewable Power Energy, expect to pay $75+ for an initial inspection of the pack and $400 to $550 for a refill with their pouch prismatic cells. That’s slightly less expensive than getting a new pack from a brand like Emotion but not much… All things considered, I’m glad to know that someone is willing to work on old batteries to keep these bikes on the road. There aren’t too many options besides a DIY approach and some have talked about this in the forums but the tools and time required can be prohibitive. I personally find it intimidating to work on my own packs because there have been fires in the past and massive battery recalls from companies like Pedego just to err on the safe side. One thing you will need with RPE is a material safety data sheet (MSDS) to help identify what is being shipped. This is something RPE will provide and you can fill out before sending ground via UPS or another provider. It’s part of what makes shipping as a consumer possible. Some electric bike shops are now becoming hazmat certified so they may be able help with shipping if you have an especially large battery. As always, I welcome input, corrections and suggestions for other ways to fix and repack e-bike batteries or even recycle old broken ones. It’s kind of an empty but evolving space but it aligns with the values of riding a bicycle and ebikes in general, sustainability :) the steps involved are usually shipping, diagnostic, unpacking, battery replacement and recycling of old parts, rebuilding and return shipping so it’s not super fast or inexpensive. 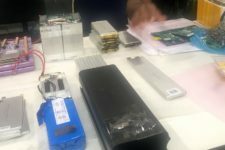 I’d love to see more big companies offering this sort of service to existing customers the way Apple Computers is now recycling old phones using robots. I think it makes sense for them given the small compact size of their phones (again, battery capacity is a big factor in shipping) and the large established customer base. Even smaller batteries can have issues as we’ve seen with the Samsung Galaxy S7 recently. Ebikes are still a niche market in the US but perhaps we’ll see new developments as they catch on or a new type of battery that isn’t as sensitive and potentially hazardous.